If you are a business-owner, you will have been driven up the wall by now by bad online reviews. You try to please everyone with your business, but that is just impossible, and some people are never grateful for service. It’s a fact that angry and unreasonable customers are so much more likely to post a review than pleased customers, and you have no power to delete a review yourself. Furthermore, some people on the internet are ‘trolls’—and find it fun to desecrate a hard-earned business reputation by posting fake reviews. These are all realities of modern business that we must now deal with. If someone posts something slanderous or even obscene in a review then your first port of call should be to report it. Reporting inappropriate posts to Google and other companies rarely works, but it is worth your time to prevent damage to your reputation. On Google, you must flag the post as inappropriate by clicking the flag icon, as described here. If Google confirms that this comment violates their policies, then you are given permission to edit it yourself. Another lesser known thing you can do is click on the reviewer’s name to view their Google+ profile. If they have made other inappropriate comments, or if this is the only thing they have posted (indicating they might be a troll, spam or bot account), then you should click the flag icon on their profile. If Google then agrees to remove their profile, then their review will be removed from your business. On Yelp, it’s the same process. Click the flag icon and then you will have to provide an explanation to the moderators as to why this post violates Yelp’s policies. More info here. On True Local, it’s the same also. On Facebook, you click the ‘v’ icon on the top right of the post and then in the menu click ‘Report post’. More info. How to (try to) contact Google about a review: Google My Business no longer provides a phone support option, so you have to start all the way at the bottom. Choose a generic item in this list to request a phone number. However the odds of success are not high. How to (try to) contact Facebook about a review: there is no Facebook phone support, but if your business is listed as a business on Facebook, you can contact them about this issue through this form. Another way to get to the source is to contact the person who actually submitted the review. This is a method that has a far higher success rate. Put aside your frustration and post a polite, apologetic and explanatory reply to the negative review. The best replies I’ve seen have apologised in the first sentence for the experience of the customer, and then go on to explain politely the misconceptions in the review and offer solutions. I can assure you that we work with real businesses and that our results are real. But don’t take my word for it. You can call some of our customers if you would like. www.thecookingroom.com.au/, www.stratacleaningeasternsuburbs.com.au/ we have thousands of customers who we manage sites for. Alternatively I can see you posted from Manly and you are more than welcome to visit our office at Level 8, 46 Market St, just opposite the QVB. Or feel free to call the number (02) 9290 2821 and you can speak to the receptionist or ask for me and I’d be happy to talk you through what we do and the real results we return for our customers. The sites you are talking about with passwords on them are ones currently under construction, I’m sure if you revisit them now you’ll see they are complete. The honest effort put into that reply goes half the way in proving that this is not a scam company in itself. If you can find a way to privately contact the reviewer, then you should do so also. The tone of your correspondence should be the same as the example above, because only by being nice to these people are you going to persuade them. The worst thing is to confirm their belief that you are not a good company. One challenge with this method is getting their contact details. No site lists these on the review. But, you can click their name to get to their profile, where they may list some contact information. The most common way you are going to be able to message these people is through the private message function of the site. But the private message functions of Facebook and Google+ are the best to use when you can—these messages are more likely to be seen by the reviewer. However, in some cases, reviews are completely anonymous and without the ability to private message. This is unlucky. This is an extension to the last point and has a higher rate of success. Since bad reviews can lose you uncountable amounts of revenue, it might be in your best interests to message the reviewer with a free offer. For instance, if you’re a restaurant, you could buy the removal of this review from the person with a free meal. This may violate some policies of the review platform, so you should check this. And the reviewer may think negatively of your business enough to not want your free offer, meaning that you may have to bribe them with money—and this seems that it would almost certainly violate some policy. This is one of the most effective methods but has its own set of challenges. The objective is to flood your reviews section with positive reviews that bury the bad review under them, and drown the low rating in high ratings to elevate your average. It’s obvious to want all these good reviews—but how do I get them? Email Loyal And Previous Customers: As long as you don’t spam your customers, you can probably get away with sending all of them an email asking them to give you a good review. Ask In Person: Asking for a review in person is always going to get a higher success rate, especially if you can make them agree to do it in person. DONT: Buy Reviews: This can seriously damage your reputation if it is found out. What’s more, Yelp, Amazon and other companies have actually sued over this in the past because false advertising is illegal. So it’s not worth it. This is the real hard-line solution. Start from scratch. It’s a very drastic solution because you will lose all your good reviews as well in the process. We don’t recommend this. It will leave your company looking like an extremely small start-up which has only just come into operation. It may even give people the impression that your company is not real—and it could confirm suspicions that you are a scammer or the like. This is really a last resort solution. All of the methods so far have been difficult but in many cases worthwhile. We encourage you to do these methods and whatever you can to improve your businesses online reputation—because this reputation is a large source of your income in the present day. Which is why we used our knowledge of online reviews to create dLook Reputation Management—an online platform for managing your reviews and online presence. ‘Management’ is the key word here. 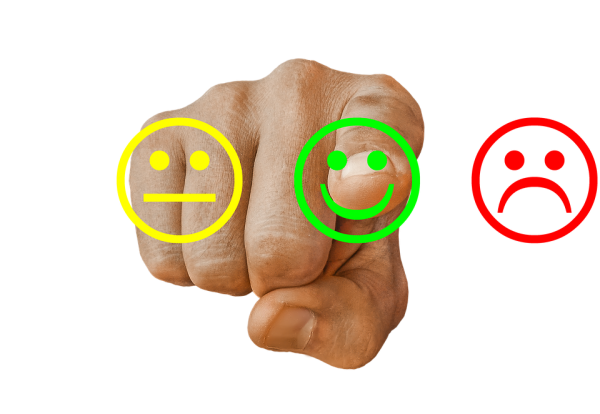 The whole problem of bad reviews that we have been talking about in this article comes from the inability to manage your own reviews on other review platforms. You have no say as to what gets posted about you on sites like Google, Yelp and True Local. But, dLook’s Reputation Management system encourages your customers to post their review on this platform instead. This platform is controlled by you, so you have the choice of whether to accept or reject a review from appearing on the net. dLook Reputation Management goes even further than managing reviews. You can keep your profiles across social media and business sites like Facebook, LinkedIn and TripAdvisor. You can monitor your reviews all over the web in a streamlined interface. No longer will you be unknowingly affected by a bad review that you don’t even know about. You will even see all mentions of your business across the web, and then a comparison of this to your competitors and the comparative growth of these mentions over time in a graph. This is the best way to see your web presence improving in contrast to the competition. 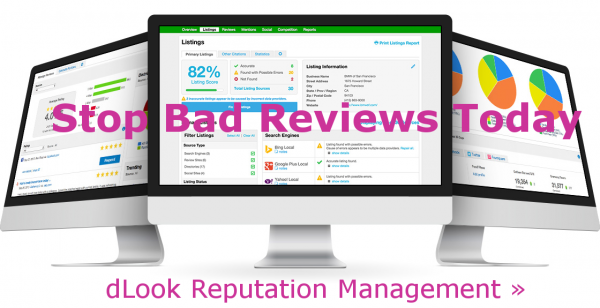 To take charge of your reviews, the best solution is dLook Reputation Management. No longer will your business be at the mercy of bad reviews, and instead you will actually start benefiting from reviews on the web.